As the nation’s leading credit repair service, Lexington Law Firm is known for its relentless methods in getting clients’ credit back on track. Their experience is extensive, with 22 lawyers on staff and locations in 16 states across the country. The proof is in the pudding when it comes to their results. In the company’s 15 years of business, they have repaired credit for hundreds of thousands of clients. 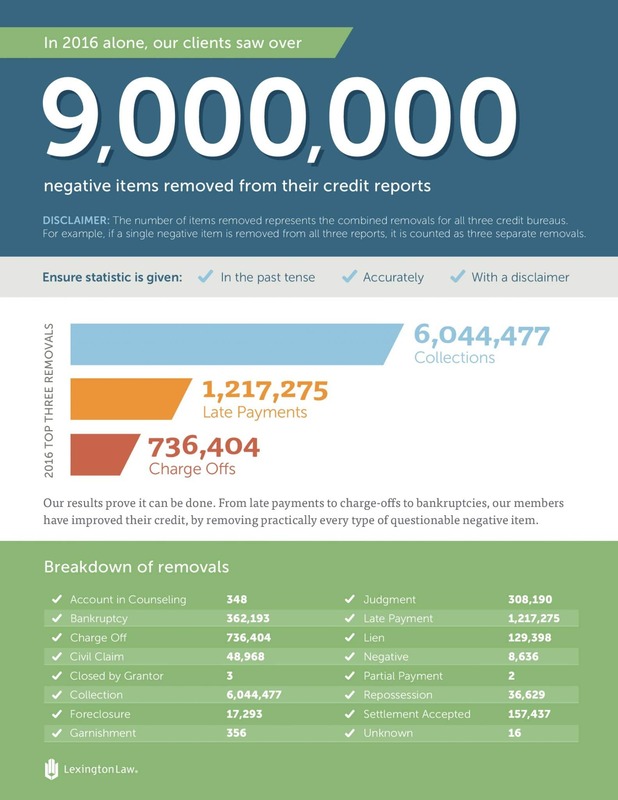 Not only that, in 2017, their total number of questionable negative items actually removed from people’s credit reports totaled more than 10 million! That’s in one year alone. The sheer quantity of successful results demonstrates why Lexington Law is such a trustworthy name when it comes to credit repair. You can choose from three different levels of service. Start off by talking to one of their credit professionals about your current situation and the items you’d like to dispute. From there they’ll help you select the best service plan to achieve your goals. Call (800) 244-0432 for a free credit consultation. It would be helpful if you had a copy of your credit report on hand, but it’s not necessary as they can pull your credit for you. It will be considered a soft inquiry and will not hurt your credit. Having accurate documentation on hand is much more reliable than relying on your memory; plus, it allows both parties to have realistic expectations moving forward because there’s no guesswork involved. After your consultation, you’ll be assigned a Case Facilitator. This is a highly trained paralegal who will perform the majority of the work for your account. If for some reason your situation is more complex than a Case Facilitator can handle alone, there are several Case Supervisors available to help out. Lexington Law has real lawyers on staff who have an integral understanding of the Fair Credit Reporting Act. That’s one of the best things about working with them: you get ongoing access to seasoned professionals with direct experience in consumer law working on your credit reports. This is the basic plan and includes credit bureau challenges and creditor interventions. This no-frills plan is great for consumers on a budget, although you will miss out on some helpful perks provided in some of the other plans. This is their most popular plan. In addition to the Standard plan’s offerings, it includes several other services. InquiryAssist helps protect your credit when creditors check your report. You’ll also get monthly advice from credit experts on how to improve your score, plus coaching through their Report Watch Program. An added bonus is daily credit monitoring alerts from TransUnion. With such personalized service, it’s no wonder why clients love the Premier plan. This one adds several perks to the previous plans’ services. They’ll craft cease and desist letters on your behalf, as well as track your FICO® credit score each month so you get accurate, real-time reports on your progress. This plan also offers real-time identity fraud alerts and other tools to manage your personal finances. Plus, you’ll receive identity protection and personal finance tools with this plan. Whether you’ve had issues with identity theft or need a more comprehensive strategy, this is a great option to select. Rather than billing customers for each item deleted from your report, they charge a flat monthly fee instead. There are no contracts so you can cancel at any time. This helps to ensure you’re never surprised by hidden fees. It also allows you to focus on a more holistic strategy rather than trying to figure out which items are worth investing your time and money in. There are no fees or penalties for canceling your account and you can do so whenever you like by contacting customer service. You never have to feel pressured or obligated to continue the service once you feel satisfied with your results. It’s a low-pressure service with high-quality results. Ready to Get Signed Up? Click Here to Visit Lexington Law Now! Choosing the best credit repair company can be challenging. We have answered the most commonly asked questions below to help you make the best decision for your own credit situation. 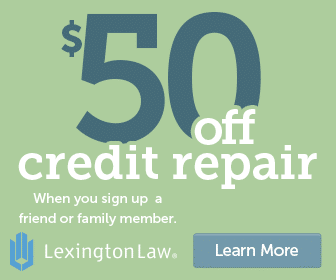 How does Lexington Law repair my credit? They work on your behalf to dispute errors and misinformation on your credit report with the credit bureaus. They maintain direct contact with creditors so that you don’t have to, and they work with you to help you understand your legal rights at every step of the process. This is especially helpful if you have aggressive collection agencies harassing you. Rather than feeling emotionally exhausted or overwhelmed, you have an even-keeled third party working on your behalf. Working with the credit bureaus is part of their business, so they know how to negotiate effectively. Simply put, they provide you with the means to effectively dispute and remove negative items on your credit report without having to do it all yourself. How do I sign up with Lexington Law? You can sign up on their website, or give them a call at (800) 244-0432 and get signed up over the phone. They will ask you a few questions in order to be sure that you are a good fit for their service and then collect the necessary information to open your account. It’s a quick and easy process, which is convenient because the sooner you start repairing your credit, the better. How long does it take for them to repair my credit? They have achieved an average of 10.2 removals within four months for past clients. However, every person’s situation is unique. It may take more or less time for you. You always have access to your Case Facilitator to inquire about the status and what work has been done on your case. Additionally, upgrading to the PremierPlus plan provides you with your monthly FICO score so you know exactly where your credit score is during any given month. Do they offer a guarantee? No reputable credit repair company can guarantee a particular result. However, Lexington Law is unique in that they are a licensed law firm and your case will be handled by actual law professionals. Because of this legal specialization and their dedication to providing excellent service, many people achieve excellent results when working with them. And remember any company that claims they can guarantee certain results is wrong. They can guarantee the services they provide, but no one can say with 100% certainty that your credit score will reach a certain threshold because of a particular repair process. What kind of items can they remove? Any negative item that has an error (even a small error) or is even questionable can be successfully disputed. These negative listings include bankruptcies, student loans, late payments, repossessions, hard inquiries, paid collections, judgments, charge-offs, etc. There are ways to dispute each of these items and have them removed. They’re experts at ensuring no legal stone is left unturned when it comes to fixing your credit. Can items be added back to my credit report once they’ve been removed? It is very rare for deleted items to be added back to your credit report. This is because consumer protection laws make it difficult for creditors to re-add a previously deleted item. Creditors know this, and it’s not often that they try to add a previously deleted debt. If you think this has happened to you, contact customer service to have a professional review the specifics. Otherwise, rest easy knowing that the quality methods used by Lexington Law provide you with lasting results — as long as you continue to maintain positive credit health with your finances. Lexington Law vs. other companies – which is best? Lexington Law gets an excellent review score and it’s our most highly-recommended credit repair company. That being said, it’s a personal choice and what works well for one person may not be a good fit for another. We encourage you to take a look at our other reviews and choose for yourself based on your own needs. Having several good choices to select from is never a bad thing. Where is Lexington Law located? They have offices throughout the United States, but their main office is located in Utah. Other states with law offices include Alabama, Arizona, California, Delaware, Kansas, Louisiana, Maine, Maryland, Michigan, Mississippi, Nevada, New Mexico, New York, North Carolina, Ohio, Pennsylvania, South Carolina, Virginia, and West Virginia. However, office visits are not required. You can sign up & communicate with their customer service team online or over the phone. And services are available to all 50 states, so it truly doesn’t matter where you live — anyone in the U.S. can benefit from using Lexington Law’s credit repair services. How much do they charge to repair your credit? Lexington Law Firm has three different price tiers for their credit repair services. The Concord Standard Service has a $14.95 setup fee but is only $89.95 per month thereafter. The Concord Premier is the most popular service. It also has a $14.95 setup fee and is $109.95 per month for the service thereafter. The PremierPlus Service has a $14.95 set up fee as well and is priced at $129.95 per month. 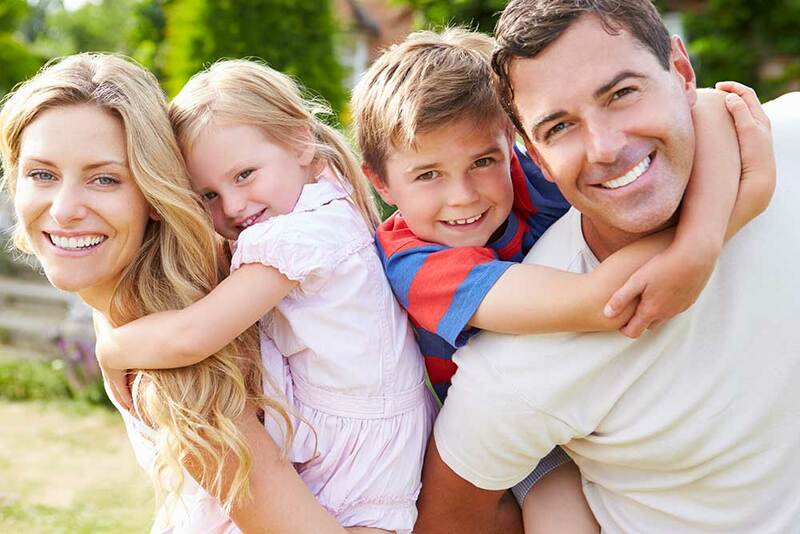 You can contact Lexington Law at (800) 244-0432 to have each of the levels of service explained to you in detail. Does they offer a discount for family members or couples? Lexington Law offers a 50% discount on the initial setup fee for family members or couples who sign up within 72 hours of one another. This is a great way to save money while starting a group challenge with friends or loved ones to repair your credit together. It’s also a smart move for couples who are ready to take the plunge with any type of joint financing, like a mortgage or shared car loan. Credit scores for both parties are weighed when applying for credit so going through the credit repair process together can make both of you stronger candidates for the best rates and terms. What is Lexington Law’s phone number? You can get in touch with Lexington Law at (800) 244-0432. What are their call hours? 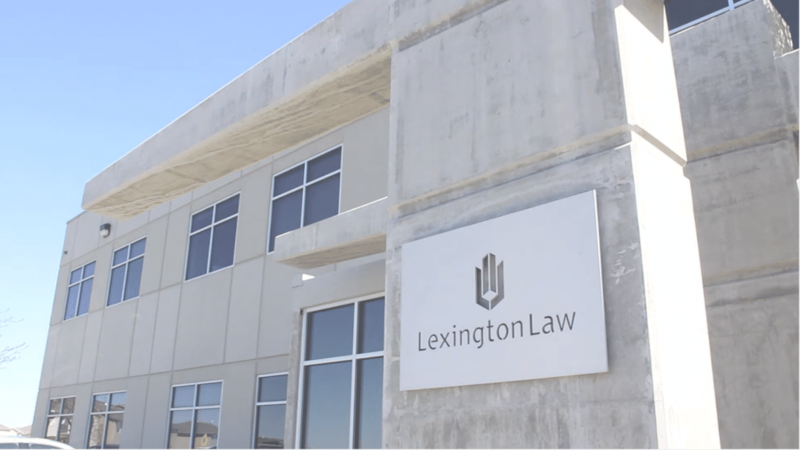 You can call Lexington Law at any time, day or night – they have professionals who work around the clock to ensure you always have access. This makes it convenient if you work unconventional hours or don’t want nosy co-workers listening to your private phone calls at the office. How do I cancel my credit repair service? You can cancel your service from Lexington Law at any time. They charge on a month-by-month basis, and you are only charged after work has been completed, not before. You can cancel by calling 1-800-341-8441. Click Here to Visit Lexington Law Now! Or call (800) 244-0432 for a Free Consultation! Copyright © 2019 Credit Repair Companies - All Rights Reserved.